Last summer Andrew and I learned to truly value local farmers. My most recent pizza was made with that value in mind. In 1919 the Cabot Creamery Cooperative was started by 94 Vermont farmers and continues to be run by its members to this day. Initially the creamery used excess milk to produce butter. After hiring a cheese maker in 1930, cheddar cheese made its first appearance in Cabot’s product line. Since then Cabot has introduced a variety of other cheeses and won multiple awards. But even with this growth the co-op remains farmer member owned. Keeping in mind Cabot’s simple roots, I chose a simple sharp cheddar cheese to top my pizza. After I pre-baked my dough I spread on marinara sauce, sprinkled on the cheese, and added my favorite pairing with cheddar cheese: bacon. My Cabot pizza recipe was simply delicious! 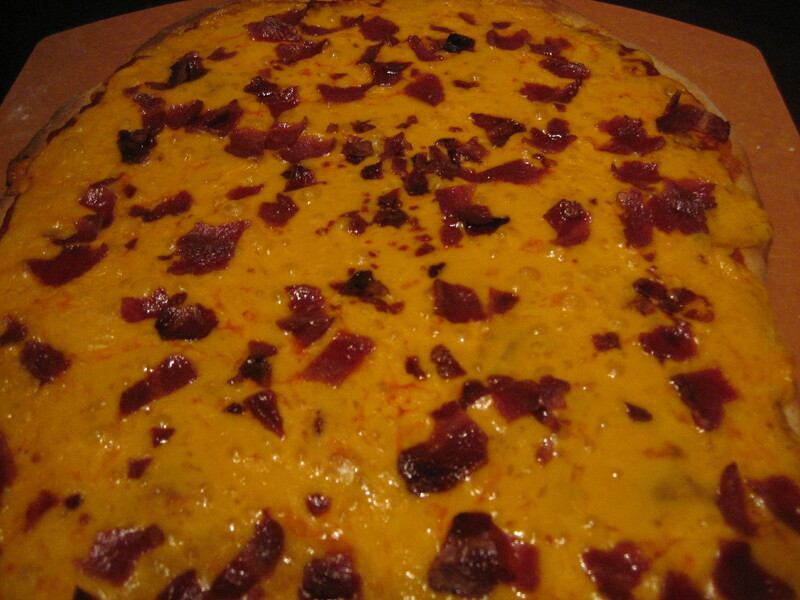 This entry was posted in Bacon, cheddar cheese, cheese, marinara, meat, sauce and tagged bacon, Cabot, cheddar cheese, cheddar cheese pizza, pizza. Bookmark the permalink.